Nauru is the smallest republic in the world, home to approximately 10,000 people and around 1000 foreign refugees. Most of these refugees are held in the harsh centre of the island within three Australian detention centres. 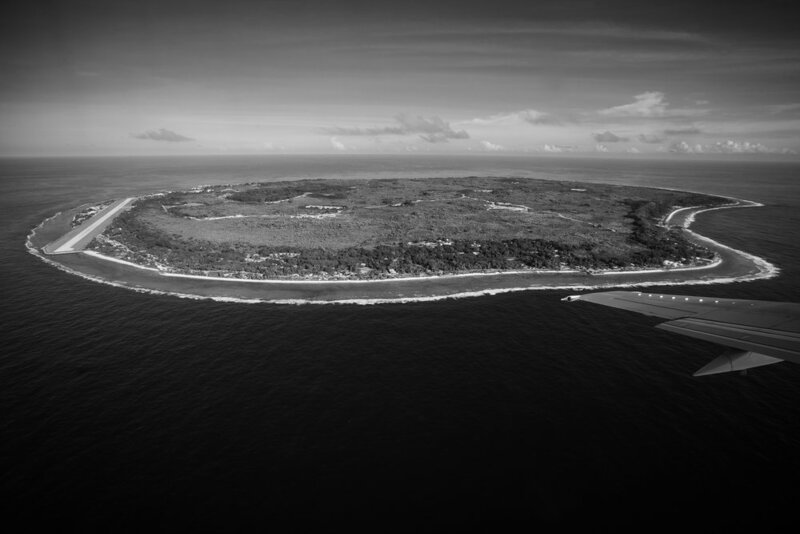 The detention centres are located in the middle of the island known to locals as ‘Topside’. Topside is home to three Australian detention centres and the desolate remains of Nauru’s once prosperous mining industry. An Iranian refugee looks out to sea outside Ijuw camp. 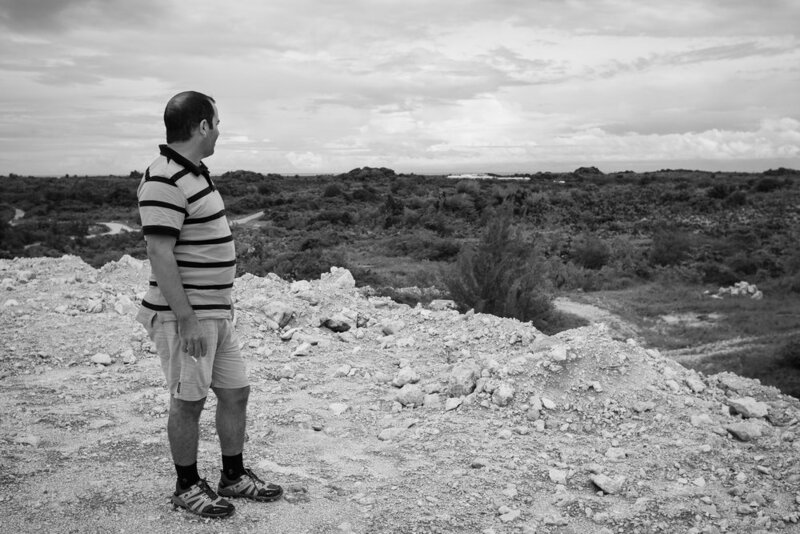 Refugees on Nauru feel an acute sense of being stuck in limbo. Those accepted as refugees were released into the community on a 6 month visa, which have long expired and despite frequent queries to immigration, have not been told what will come next. Others whose claims are still being processed continue to be held in detention almost two years after arriving on Nauru. Graffiti scrawled on the side of a shipping container has been altered afterwards in an attempt to hide the original meaning. There is strong animosity directed at the refugees from some of the locals who do not want the refugees on Nauru. Tamil refugees play a game of cricket in Aiwo district. Refugees still held in detention can be taken out of the centres into the community, however are under constant watch from immigration officials. A Transfield immigration bus drives amongst unused shipping containers. Transfield won the contract to run Australia’s detention centres on Nauru and Manus Island for $1.22 billion, and the presence of the contractor can be felt everywhere on Nauru. The unforgiving Nauruan coastline is littered with jagged limestone pinnacles, providing the sensation of another layer of containment. Refugees sit around outside Ijuw camp. While some refugees have been released into the wider Nauruan community, a sense of community is lacking on the island. Many Nauruans believe the refugees are stealing jobs and sleeping with local women, some are scared refugees may have terror-related pasts. Refugees are scared of verbal, physical and sexual abuse from locals. In 2014, refugees were gradually granted asylum by the Nauruan government and were released into the community. Anibare is an open camp on the eastern side of Nauru home to those who have been granted asylum. Refugees living here can come and go as they please, but the camps are still guarded and behind fences. Refugees are forbidden to talk to journalists, so refugees had to be secretly met and interviewed in an abandoned phosphate mine site. It is darkly joked on Nauru that the refugees are the new phosphate, meaning the industry is very important to the economic survival of the country. An Iranian refugee who doesn’t want his face shown looks down over RPC 2, the centre he and his wife were held in for close to a year before being released into the community after being found to be ‘genuine’ refugees. 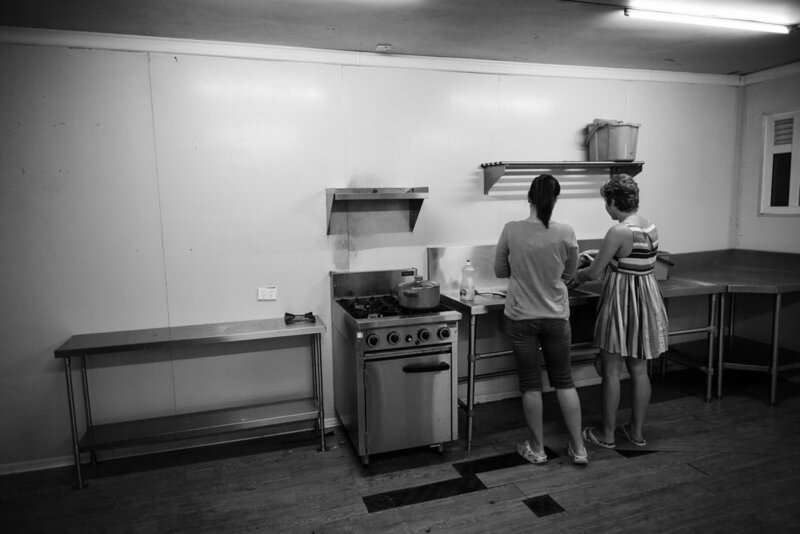 Anibare camp has one sparse communal kitchen, that is often out of order, to serve all the families, which makes it very difficult to orchestrate cooking dinner. Many of the refugees have taken to cooking meals in their own bathrooms. Many refugees have resorted to setting up makeshift cooking facilities in the bathrooms of their cramped rooms as the group facilities aren’t nearly adequate to be used for so many people. Nearby Nibok camp is home to families and, in this particular block, unaccompanied minors on Nauru. While clean and new, it is sparse, bleak housing unsuited to accommodating adolescent children on Nauru without family. The area known as Location Block fronts onto the sea and is a vibrant area of Nauru full of local Nauruans and other Pacific Islanders who live there with cheap rent. 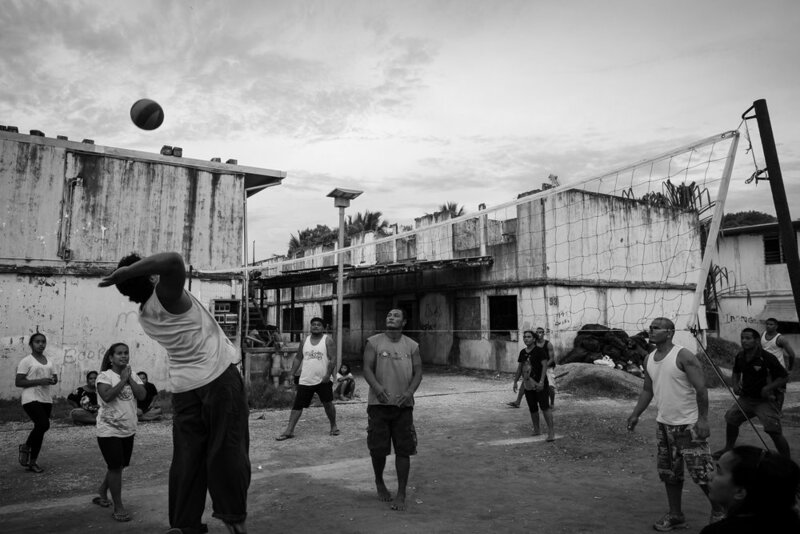 Locals play volleyball in Location Block. Many of the locals who live in this area actually own land elsewhere on Nauru that is used by the detention centres. They live here because it is cheap and the money they collect for the lease on their land elsewhere is enough for them to live on. A young Nauruan boy plays with a toy gun in Location Block. Locals watch the sunset from the beach at Location Block. 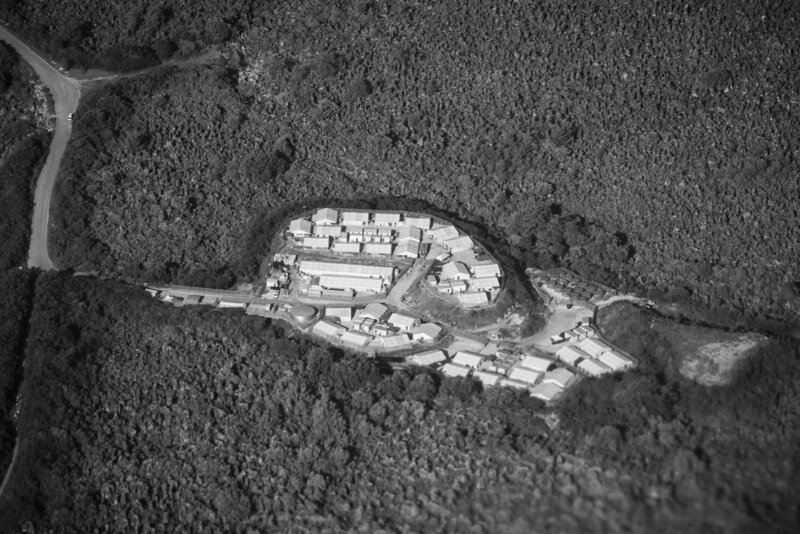 Location Block was first set up to be accommodation for the phosphate miners, but when the mining work dried up, the area was left abandoned and has since been occupied with local Nauruans and other Pacific Islanders looking for cheap rent. A young girl rides past abandoned houses in Location Block. The mangled wreckage of the old cantilevers that were used to transport phosphate off the island onto waiting ships serve as a potent reminder of the extreme ‘boom and bust’ cycle of Nauru’s recent history. The salty air, poor roads and bad maintenance are harsh on the cars in Nauru, and the island is littered with the often glamorous wrecks of old cars bought in the heyday of Nauru’s mining boom. It is island folklore that during the prosperous phosphate boom, the then police chief had a brand new Lamborghini shipped to Nauru. Locals say this huge four-storey house in Ewa was built because down the road there was a three-storey house, and this owner wanted his to be grander. When bad planning and money problems hit, it was simply abandoned. With no natural resources except the scant remaining phosphate, Nauru must import virtually everything. From food and water, to clothing and Harley Davidsons, the country is littered with empty shipping containers used to import goods. 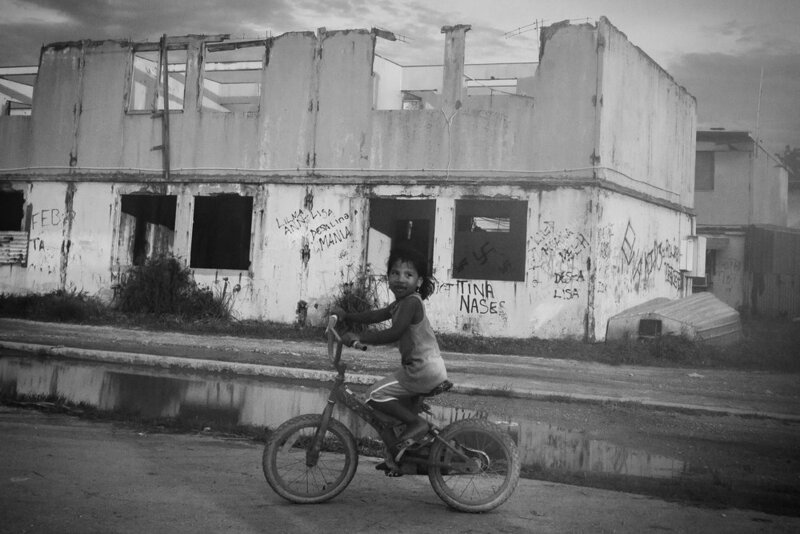 Young Nauruan children drive about on a four-wheel bike on Boxing Day, 2014. Nauru has a heavily materialistic culture, and despite many families not appearing to be greatly wealthy, are wont to buying flashy gifts. Two men drink heavily in a beachside ruin on Boxing Day, 2014. Refugees who have been released into the community on Nauru are warned to take care on days when locals might drink too much, and on the day of the Australian Rules Football Grand Final in September 2014, the refugees were warned not to go outdoors at all. Three Iranian women watch their friends swimming in Anibare harbour, while a local lifeguard watches on. In a program run by an expat Australian, two refugees have also received life-guard accreditation on Nauru. The harbour in Anibare is only a few hundred metres from Anibare refugee camp, and is a popular place for swimming. Inside Anibare camp, the conditions are cramped and refugees wonder how long they will have to endure living there. With their temporary six-month settlement visa long expired and queries to the immigration department receiving no response, they live in a state of limbo. An Iranian couple passes time inside their room in Anibare camp. Anibare camp holds around 40 families who were released on a six-month visa into the community. Those six months are long up and no one’s visa has been renewed, so they merely wait in limbo, unsure of what will happen next. Anibare is also home to single Somali women who feel particularly vulnerable on the small island. Hawo, right, was attacked by local men twice in two days. The single Somali women have forged close bonds, as they have no one else to rely on in such a foreign place. They told me they sleep wearing jeans because it will make it harder to be raped. In 2016, one of the Somalis set herself on fire in a horrific act of despair. Annissa (name changed) escaped Somalia after her husband and baby were killed by Al-Shabaab. Annissa and the other single Somali women now live in fear from the local Nauruans who come and knock on their doors and windows at night. She told the Australian immigration that she feels unsafe and requested to be moved back into the detention centres in the middle of the island, but the request was denied. Amineh (name changed) and her family fled Iran in 2013. They were picked up by the Australian navy from a struggling boat and taken to Christmas Island, where they arrived just days after then PM Kevin Rudd made the declaration that ensured no-one arriving in Australia by boat would be settled on Australian shores. During her incarceration in Nauru, Amineh developed severe depression leading to an admission to a psychiatric ward in Brisbane, and on top of that was diagnosed with breast cancer. Despite her psychiatrist warning of significant chance of relapse and harm to herself and/or her family if she was returned to Nauru, she was sent back against the doctor’s orders and lives in perpetual misery. Two local Nauruan boys watch a plane take off. When a plane takes off or lands on Nauru, you can see it from anywhere on the island, and they quite often fly directly over the detention centres, teasingly in full view of the refugees below.